Nairobi National Park is Kenya’s oldest protected area. It is also unique in being the only place in the world where large animals such as lions, rhinos, giraffe and zebra roam wild within the boundaries of a major urban centre. The Park a symbol of Kenya’s national identity, a wildlife sanctuary of global significance—especially for endangered black rhinos—and an irreplaceable resource for the health, well-being and education of citizens. In recent years, the park has come under increasing threat from uncontrolled development around its boundaries. Now the government is proposing to route the New Standard Gauge Railway (SGR) link from Nairobi to Mombasa right through the middle of the Park. The proposal has alarmed lovers of nature and wildlife in Kenya and around the world. The SGR would cut the Park in two and impede wildlife movements. It would destroy forever the tranquillity that makes the Park so valuable as a refuge from the frenetic pace and stress of urban life. 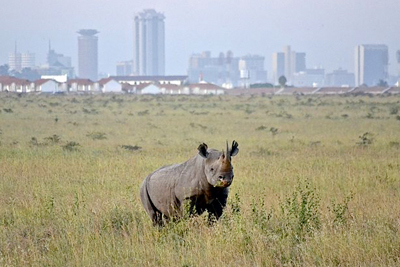 Nairobi Park is one of a number of protected areas currently under threat from major infrastructure projects. WildlifeDirect understands the importance of good infrastructure for the economic development that is vital for poverty alleviation and the well-being of citizens. But we think the government is getting the balance wrong. Kenya’s wildlife areas also make a massive contribution to the economy, in addition to incalculable spiritual, cultural, and educational benefits. Infrastructure can be re-sited or re-routed but once a protected area is lost it is gone forever. Like other countries, Kenya has laws and procedures in place to guide decision making in cases such as these. WildlifeDirect is concerned that these procedures are being flouted by the government in order to get the decision that it wants. With the aim of ensuring transparency and promoting public engagement in decision-making, WildlifeDirect recently convened an Open Space Event to discuss the implications of the SGR proposal. On October 27th, concerned citizens and stakeholders from Kenya Railways, Kenya Wildlife Service, and several conservation and research organizations met for a dialogue on “How can we best achieve a balance between conservation and infrastructure development in SGR Phase II?” The 176 participants all agreed that Kenya needs the SGR as it will bring great rewards in terms of economic growth and poverty alleviation. However, there was also overwhelming agreement among participants that the SGR should not go through Nairobi National Park. WildlifeDirect will continue to campaign to save the park. We call on nature lovers everywhere to join us in urging the government to adopt an alternative route. This courageous decision would not only save Nairobi Park, but also establish Kenya’s leadership of efforts to achieve sustainable development for Africa and its people, while protecting wildlife and the environment.